For other uses, see Steel (disambiguation). "Steel worker" redirects here. For other uses, see Steel worker (disambiguation). Steel is an alloy of iron and carbon, and sometimes other elements. Because of its high tensile strength and low cost, it is a major component used in buildings, infrastructure, tools, ships, automobiles, machines, appliances, and weapons. Iron is the base metal of steel. Iron is able to take on two crystalline forms (allotropic forms), body centered cubic and face centered cubic, depending on its temperature. In the body-centered cubic arrangement, there is an iron atom in the center and eight atoms at the vertices of each cubic unit cell; in the face-centered cubic, there is one atom at the center of each of the six faces of the cubic unit cell and eight atoms at its vertices. It is the interaction of the allotropes of iron with the alloying elements, primarily carbon, that gives steel and cast iron their range of unique properties. In pure iron, the crystal structure has relatively little resistance to the iron atoms slipping past one another, and so pure iron is quite ductile, or soft and easily formed. In steel, small amounts of carbon, other elements, and inclusions within the iron act as hardening agents that prevent the movement of dislocations that are common in the crystal lattices of iron atoms. The carbon in typical steel alloys may contribute up to 2.14% of its weight. Varying the amount of carbon and many other alloying elements, as well as controlling their chemical and physical makeup in the final steel (either as solute elements, or as precipitated phases), slows the movement of those dislocations that make pure iron ductile, and thus controls and enhances its qualities. These qualities include such things as the hardness, quenching behavior, need for annealing, tempering behavior, yield strength, and tensile strength of the resulting steel. The increase in steel's strength compared to pure iron is possible only by reducing iron's ductility. Steel was produced in bloomery furnaces for thousands of years, but its large-scale, industrial use began only after more efficient production methods were devised in the 17th century, with the production of blister steel and then crucible steel. With the invention of the Bessemer process in the mid-19th century, a new era of mass-produced steel began. This was followed by the Siemens–Martin process and then the Gilchrist–Thomas process that refined the quality of steel. With their introductions, mild steel replaced wrought iron. Further refinements in the process, such as basic oxygen steelmaking (BOS), largely replaced earlier methods by further lowering the cost of production and increasing the quality of the final product. Today, steel is one of the most common manmade materials in the world, with more than 1.6 billion tons produced annually. Modern steel is generally identified by various grades defined by assorted standards organizations. The noun steel originates from the Proto-Germanic adjective stahliją or stakhlijan (made of steel), which is related to stahlaz or stahliją (standing firm). The carbon content of steel is between 0.002% and 2.14% by weight for plain iron–carbon alloys. These values vary depending on alloying elements such as manganese, chromium, nickel, tungsten, and so on. Basically, steel is an iron-carbon alloy that does not undergo eutectic reaction. In contrast, cast iron does undergo eutectic reaction. Too little carbon content leaves (pure) iron quite soft, ductile, and weak. Carbon contents higher than those of steel make a brittle alloy commonly called pig iron. While iron alloyed with carbon is called carbon steel, alloy steel is steel to which other alloying elements have been intentionally added to modify the characteristics of steel. Common alloying elements include: manganese, nickel, chromium, molybdenum, boron, titanium, vanadium, tungsten, cobalt, and niobium. Additional elements, most frequently considered undesirable, are also important in steel: phosphorus, sulfur, silicon, and traces of oxygen, nitrogen, and copper. Plain carbon-iron alloys with a higher than 2.1% carbon content are known as cast iron. With modern steelmaking techniques such as powder metal forming, it is possible to make very high-carbon (and other alloy material) steels, but such are not common. Cast iron is not malleable even when hot, but it can be formed by casting as it has a lower melting point than steel and good castability properties. 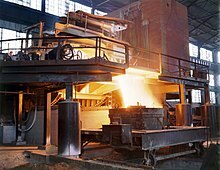 Certain compositions of cast iron, while retaining the economies of melting and casting, can be heat treated after casting to make malleable iron or ductile iron objects. Steel is distinguishable from wrought iron (now largely obsolete), which may contain a small amount of carbon but large amounts of slag. Iron is commonly found in the Earth's crust in the form of an ore, usually an iron oxide, such as magnetite or hematite. Iron is extracted from iron ore by removing the oxygen through its combination with a preferred chemical partner such as carbon which is then lost to the atmosphere as carbon dioxide. This process, known as smelting, was first applied to metals with lower melting points, such as tin, which melts at about 250 °C (482 °F), and copper, which melts at about 1,100 °C (2,010 °F), and the combination, bronze, which has a melting point lower than 1,083 °C (1,981 °F). In comparison, cast iron melts at about 1,375 °C (2,507 °F). Small quantities of iron were smelted in ancient times, in the solid state, by heating the ore in a charcoal fire and then welding the clumps together with a hammer and in the process squeezing out the impurities. With care, the carbon content could be controlled by moving it around in the fire. Unlike copper and tin, liquid or solid iron dissolves carbon quite readily. All of these temperatures could be reached with ancient methods used since the Bronze Age. Since the oxidation rate of iron increases rapidly beyond 800 °C (1,470 °F), it is important that smelting take place in a low-oxygen environment. Smelting, using carbon to reduce iron oxides, results in an alloy (pig iron) that retains too much carbon to be called steel. The excess carbon and other impurities are removed in a subsequent step. Other materials are often added to the iron/carbon mixture to produce steel with desired properties. Nickel and manganese in steel add to its tensile strength and make the austenite form of the iron-carbon solution more stable, chromium increases hardness and melting temperature, and vanadium also increases hardness while making it less prone to metal fatigue. To inhibit corrosion, at least 11% chromium is added to steel so that a hard oxide forms on the metal surface; this is known as stainless steel. Tungsten slows the formation of cementite, keeping carbon in the iron matrix and allowing martensite to preferentially form at slower quench rates, resulting in high speed steel. On the other hand, sulfur, nitrogen, and phosphorus are considered contaminants that make steel more brittle and are removed from the steel melt during processing. The density of steel varies based on the alloying constituents but usually ranges between 7,750 and 8,050 kg/m3 (484 and 503 lb/cu ft), or 7.75 and 8.05 g/cm3 (4.48 and 4.65 oz/cu in). Even in a narrow range of concentrations of mixtures of carbon and iron that make a steel, a number of different metallurgical structures, with very different properties can form. Understanding such properties is essential to making quality steel. At room temperature, the most stable form of pure iron is the body-centered cubic (BCC) structure called alpha iron or α-iron. It is a fairly soft metal that can dissolve only a small concentration of carbon, no more than 0.005% at 0 °C (32 °F) and 0.021 wt% at 723 °C (1,333 °F). The inclusion of carbon in alpha iron is called ferrite. At 910 °C, pure iron transforms into a face-centered cubic (FCC) structure, called gamma iron or γ-iron. The inclusion of carbon in gamma iron is called austenite. The more open FCC structure of austenite can dissolve considerably more carbon, as much as 2.1% (38 times that of ferrite) carbon at 1,148 °C (2,098 °F), which reflects the upper carbon content of steel, beyond which is cast iron. When carbon moves out of solution with iron, it forms a very hard, but brittle material called cementite (Fe3C). When steels with exactly 0.8% carbon (known as a eutectoid steel), are cooled, the austenitic phase (FCC) of the mixture attempts to revert to the ferrite phase (BCC). The carbon no longer fits within the FCC austenite structure, resulting in an excess of carbon. One way for carbon to leave the austenite is for it to precipitate out of solution as cementite, leaving behind a surrounding phase of BCC iron called ferrite with a small percentage of carbon in solution. The two, ferrite and cementite, precipitate simultaneously producing a layered structure called pearlite, named for its resemblance to mother of pearl. In a hypereutectoid composition (greater than 0.8% carbon), the carbon will first precipitate out as large inclusions of cementite at the austenite grain boundaries until the percentage of carbon in the grains has decreased to the eutectoid composition (0.8% carbon), at which point the pearlite structure forms. For steels that have less than 0.8% carbon (hypoeutectoid), ferrite will first form within the grains until the remaining composition rises to 0.8% of carbon, at which point the pearlite structure will form. No large inclusions of cementite will form at the boundaries in hypoeuctoid steel. The above assumes that the cooling process is very slow, allowing enough time for the carbon to migrate. As the rate of cooling is increased the carbon will have less time to migrate to form carbide at the grain boundaries but will have increasingly large amounts of pearlite of a finer and finer structure within the grains; hence the carbide is more widely dispersed and acts to prevent slip of defects within those grains, resulting in hardening of the steel. At the very high cooling rates produced by quenching, the carbon has no time to migrate but is locked within the face-centered austenite and forms martensite. Martensite is a highly strained and stressed, supersaturated form of carbon and iron and is exceedingly hard but brittle. Depending on the carbon content, the martensitic phase takes different forms. Below 0.2% carbon, it takes on a ferrite BCC crystal form, but at higher carbon content it takes a body-centered tetragonal (BCT) structure. There is no thermal activation energy for the transformation from austenite to martensite. [clarification needed] Moreover, there is no compositional change so the atoms generally retain their same neighbors. Martensite has a lower density (it expands during the cooling) than does austenite, so that the transformation between them results in a change of volume. In this case, expansion occurs. Internal stresses from this expansion generally take the form of compression on the crystals of martensite and tension on the remaining ferrite, with a fair amount of shear on both constituents. If quenching is done improperly, the internal stresses can cause a part to shatter as it cools. At the very least, they cause internal work hardening and other microscopic imperfections. It is common for quench cracks to form when steel is water quenched, although they may not always be visible. There are many types of heat treating processes available to steel. The most common are annealing, quenching, and tempering. Heat treatment is effective on compositions above the eutectoid composition (hypereutectoid) of 0.8% carbon. Hypoeutectoid steel does not benefit from heat treatment. Annealing is the process of heating the steel to a sufficiently high temperature to relieve local internal stresses. It does not create a general softening of the product but only locally relieves strains and stresses locked up within the material. Annealing goes through three phases: recovery, recrystallization, and grain growth. The temperature required to anneal a particular steel depends on the type of annealing to be achieved and the alloying constituents. Quenching involves heating the steel to create the austenite phase then quenching it in water or oil. This rapid cooling results in a hard but brittle martensitic structure. The steel is then tempered, which is just a specialized type of annealing, to reduce brittleness. In this application the annealing (tempering) process transforms some of the martensite into cementite, or spheroidite and hence it reduces the internal stresses and defects. The result is a more ductile and fracture-resistant steel. When iron is smelted from its ore, it contains more carbon than is desirable. To become steel, it must be reprocessed to reduce the carbon to the correct amount, at which point other elements can be added. In the past, steel facilities would cast the raw steel product into ingots which would be stored until use in further refinement processes that resulted in the finished product. In modern facilities, the initial product is close to the final composition and is continuously cast into long slabs, cut and shaped into bars and extrusions and heat treated to produce a final product. Today only a small fraction is cast into ingots. Approximately 96% of steel is continuously cast, while only 4% is produced as ingots. The ingots are then heated in a soaking pit and hot rolled into slabs, billets, or blooms. Slabs are hot or cold rolled into sheet metal or plates. Billets are hot or cold rolled into bars, rods, and wire. Blooms are hot or cold rolled into structural steel, such as I-beams and rails. In modern steel mills these processes often occur in one assembly line, with ore coming in and finished steel products coming out. Sometimes after a steel's final rolling, it is heat treated for strength; however, this is relatively rare. Steel was known in antiquity and was produced in bloomeries and crucibles. The earliest known production of steel is seen in pieces of ironware excavated from an archaeological site in Anatolia (Kaman-Kalehöyük) and are nearly 4,000 years old, dating from 1800 BC. Horace identifies steel weapons such as the falcata in the Iberian Peninsula, while Noric steel was used by the Roman military. The reputation of Seric iron of South India (wootz steel) grew considerably in the rest of the world. Metal production sites in Sri Lanka employed wind furnaces driven by the monsoon winds, capable of producing high-carbon steel. Large-scale Wootz steel production in Tamilakam using crucibles and carbon sources such as the plant Avāram occurred by the sixth century BC, the pioneering precursor to modern steel production and metallurgy. The Chinese of the Warring States period (403–221 BC) had quench-hardened steel, while Chinese of the Han dynasty (202 BC – 220 AD) created steel by melting together wrought iron with cast iron, gaining an ultimate product of a carbon-intermediate steel by the 1st century AD. Evidence of the earliest production of high carbon steel in India are found in Kodumanal in Tamil Nadu, the Golconda area in Andhra Pradesh and Karnataka, and in the Samanalawewa areas of Sri Lanka. This came to be known as Wootz steel, produced in South India by about sixth century BC and exported globally. The steel technology existed prior to 326 BC in the region as they are mentioned in literature of Sangam Tamil, Arabic and Latin as the finest steel in the world exported to the Romans, Egyptian, Chinese and Arab worlds at that time – what they called Seric Iron. A 200 BC Tamil trade guild in Tissamaharama, in the South East of Sri Lanka, brought with them some of the oldest iron and steel artifacts and production processes to the island from the classical period. The Chinese and locals in Anuradhapura, Sri Lanka had also adopted the production methods of creating Wootz steel from the Chera Dynasty Tamils of South India by the 5th century AD. In Sri Lanka, this early steel-making method employed a unique wind furnace, driven by the monsoon winds, capable of producing high-carbon steel. Since the technology was acquired from the Tamilians from South India, the origin of steel technology in India can be conservatively estimated at 400–500 BC. The manufacture of what came to be called Wootz, or Damascus steel, famous for its durability and ability to hold an edge, may have been taken by the Arabs from Persia, who took it from India. It was originally created from a number of different materials including various trace elements, apparently ultimately from the writings of Zosimos of Panopolis. In 327 BC, Alexander the Great was rewarded by the defeated King Porus, not with gold or silver but with 30 pounds of steel. Recent studies have suggested that carbon nanotubes were included in its structure, which might explain some of its legendary qualities, though given the technology of that time, such qualities were produced by chance rather than by design. Natural wind was used where the soil containing iron was heated by the use of wood. The ancient Sinhalese managed to extract a ton of steel for every 2 tons of soil, a remarkable feat at the time. One such furnace was found in Samanalawewa and archaeologists were able to produce steel as the ancients did. Crucible steel, formed by slowly heating and cooling pure iron and carbon (typically in the form of charcoal) in a crucible, was produced in Merv by the 9th to 10th century AD. In the 11th century, there is evidence of the production of steel in Song China using two techniques: a "berganesque" method that produced inferior, inhomogeneous steel, and a precursor to the modern Bessemer process that used partial decarbonization via repeated forging under a cold blast. Since the 17th century, the first step in European steel production has been the smelting of iron ore into pig iron in a blast furnace. Originally employing charcoal, modern methods use coke, which has proven more economical. In these processes pig iron was refined (fined) in a finery forge to produce bar iron, which was then used in steel-making. 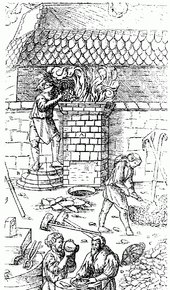 The production of steel by the cementation process was described in a treatise published in Prague in 1574 and was in use in Nuremberg from 1601. A similar process for case hardening armor and files was described in a book published in Naples in 1589. The process was introduced to England in about 1614 and used to produce such steel by Sir Basil Brooke at Coalbrookdale during the 1610s. The raw material for this process were bars of iron. During the 17th century it was realized that the best steel came from oregrounds iron of a region north of Stockholm, Sweden. This was still the usual raw material source in the 19th century, almost as long as the process was used. Crucible steel is steel that has been melted in a crucible rather than having been forged, with the result that it is more homogeneous. Most previous furnaces could not reach high enough temperatures to melt the steel. The early modern crucible steel industry resulted from the invention of Benjamin Huntsman in the 1740s. Blister steel (made as above) was melted in a crucible or in a furnace, and cast (usually) into ingots. White-hot steel pouring out of an electric arc furnace. 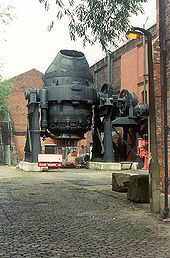 Another 19th-century steelmaking process was the Siemens-Martin process, which complemented the Bessemer process. It consisted of co-melting bar iron (or steel scrap) with pig iron. These methods of steel production were rendered obsolete by the Linz-Donawitz process of basic oxygen steelmaking (BOS), developed in the 1950s, and other oxygen steel making methods. Basic oxygen steelmaking is superior to previous steelmaking methods because the oxygen pumped into the furnace limited impurities, primarily nitrogen, that previously had entered from the air used. Today, electric arc furnaces (EAF) are a common method of reprocessing scrap metal to create new steel. They can also be used for converting pig iron to steel, but they use a lot of electrical energy (about 440 kWh per metric ton), and are thus generally only economical when there is a plentiful supply of cheap electricity. The steel industry is often considered an indicator of economic progress, because of the critical role played by steel in infrastructural and overall economic development. In 1980, there were more than 500,000 U.S. steelworkers. By 2000, the number of steelworkers fell to 224,000. The economic boom in China and India caused a massive increase in the demand for steel. Between 2000 and 2005, world steel demand increased by 6%. Since 2000, several Indian and Chinese steel firms have risen to prominence,[according to whom?] such as Tata Steel (which bought Corus Group in 2007), Baosteel Group and Shagang Group. As of 2017, though, ArcelorMittal is the world's largest steel producer. In 2005, the British Geological Survey stated China was the top steel producer with about one-third of the world share; Japan, Russia, and the US followed respectively. In 2008, steel began trading as a commodity on the London Metal Exchange. At the end of 2008, the steel industry faced a sharp downturn that led to many cut-backs. Steel is one of the world's most-recycled materials, with a recycling rate of over 60% globally; in the United States alone, over 82,000,000 metric tons (81,000,000 long tons; 90,000,000 short tons) were recycled in the year 2008, for an overall recycling rate of 83%. As more steel is produced than is scrapped, the amount of recycled raw materials is about 40% of the total of steel produced - in 2016, 1,628,000,000 tonnes (1.602×109 long tons; 1.795×109 short tons) of crude steel was produced globally, with 630,000,000 tonnes (620,000,000 long tons; 690,000,000 short tons) recycled. Modern steels are made with varying combinations of alloy metals to fulfill many purposes. Carbon steel, composed simply of iron and carbon, accounts for 90% of steel production. Low alloy steel is alloyed with other elements, usually molybdenum, manganese, chromium, or nickel, in amounts of up to 10% by weight to improve the hardenability of thick sections. High strength low alloy steel has small additions (usually < 2% by weight) of other elements, typically 1.5% manganese, to provide additional strength for a modest price increase. Recent Corporate Average Fuel Economy (CAFE) regulations have given rise to a new variety of steel known as Advanced High Strength Steel (AHSS). This material is both strong and ductile so that vehicle structures can maintain their current safety levels while using less material. There are several commercially available grades of AHSS, such as dual-phase steel, which is heat treated to contain both a ferritic and martensitic microstructure to produce a formable, high strength steel. Transformation Induced Plasticity (TRIP) steel involves special alloying and heat treatments to stabilize amounts of austenite at room temperature in normally austenite-free low-alloy ferritic steels. By applying strain, the austenite undergoes a phase transition to martensite without the addition of heat. Twinning Induced Plasticity (TWIP) steel uses a specific type of strain to increase the effectiveness of work hardening on the alloy. Carbon Steels are often galvanized, through hot-dip or electroplating in zinc for protection against rust. Stainless steels contain a minimum of 11% chromium, often combined with nickel, to resist corrosion. Some stainless steels, such as the ferritic stainless steels are magnetic, while others, such as the austenitic, are nonmagnetic. Corrosion-resistant steels are abbreviated as CRES. Some more modern steels include tool steels, which are alloyed with large amounts of tungsten and cobalt or other elements to maximize solution hardening. This also allows the use of precipitation hardening and improves the alloy's temperature resistance. Tool steel is generally used in axes, drills, and other devices that need a sharp, long-lasting cutting edge. Other special-purpose alloys include weathering steels such as Cor-ten, which weather by acquiring a stable, rusted surface, and so can be used un-painted. Maraging steel is alloyed with nickel and other elements, but unlike most steel contains little carbon (0.01%). This creates a very strong but still malleable steel. Eglin steel uses a combination of over a dozen different elements in varying amounts to create a relatively low-cost steel for use in bunker buster weapons. Hadfield steel (after Sir Robert Hadfield) or manganese steel contains 12–14% manganese which when abraded strain-hardens to form an incredibly hard skin which resists wearing. Examples include tank tracks, bulldozer blade edges and cutting blades on the jaws of life. Most of the more commonly used steel alloys are categorized into various grades by standards organizations. For example, the Society of Automotive Engineers has a series of grades defining many types of steel. The American Society for Testing and Materials has a separate set of standards, which define alloys such as A36 steel, the most commonly used structural steel in the United States. The JIS also define series of steel grades that are being used extensively in Japan as well as in developing countries. Iron and steel are used widely in the construction of roads, railways, other infrastructure, appliances, and buildings. Most large modern structures, such as stadiums and skyscrapers, bridges, and airports, are supported by a steel skeleton. Even those with a concrete structure employ steel for reinforcing. In addition, it sees widespread use in major appliances and cars. Despite growth in usage of aluminium, it is still the main material for car bodies. Steel is used in a variety of other construction materials, such as bolts, nails, and screws and other household products and cooking utensils. Other common applications include shipbuilding, pipelines, mining, offshore construction, aerospace, white goods (e.g. washing machines), heavy equipment such as bulldozers, office furniture, steel wool, tools, and armour in the form of personal vests or vehicle armour (better known as rolled homogeneous armour in this role). Before the introduction of the Bessemer process and other modern production techniques, steel was expensive and was only used where no cheaper alternative existed, particularly for the cutting edge of knives, razors, swords, and other items where a hard, sharp edge was needed. It was also used for springs, including those used in clocks and watches. With the advent of speedier and thriftier production methods, steel has become easier to obtain and much cheaper. It has replaced wrought iron for a multitude of purposes. However, the availability of plastics in the latter part of the 20th century allowed these materials to replace steel in some applications due to their lower fabrication cost and weight. Carbon fiber is replacing steel in some cost insensitive applications such as aircraft, sports equipment and high end automobiles. The inside and outside body of automobiles, trains, and ships. Steel manufactured after World War II became contaminated with radionuclides by nuclear weapons testing. Low-background steel, steel manufactured prior to 1945, is used for certain radiation-sensitive applications such as Geiger counters and radiation shielding. ^ Harper, Douglas. "steel". Online Etymology Dictionary. ^ Prawoto, Yunan (2013). Integration of Mechanics into Materials Science Research: A Guide for Material Researchers in Analytical, Computational and Experimental Methods. Lulu.com. ISBN 978-1-300-71235-0. ^ a b c d e Ashby, Michael F. & Jones, David R.H. (1992) . Engineering Materials 2 (with corrections ed.). Oxford: Pergamon Press. ISBN 0-08-032532-7. ^ a b Smelting. Encyclopædia Britannica. 2007. ^ a b c "Alloying of Steels". Metallurgical Consultants. 2006-06-28. Archived from the original on 2007-02-21. Retrieved 2007-02-28. ^ Elert, Glenn. "Density of Steel". Retrieved 2009-04-23. Smith & Hashemi 2006, p. 363—2.08%. Degarmo, Black & Kohser 2003, p. 75—2.11%. ^ Smith & Hashemi 2006, p. 363. ^ Smith & Hashemi 2006, pp. 365–372. ^ a b Smith & Hashemi 2006, pp. 373–378. ^ "Quench hardening of steel". keytometals.com. Archived from the original on 2009-02-17. Retrieved 2009-07-19. ^ Smith & Hashemi 2006, p. 249. ^ Smith & Hashemi 2006, p. 388. ^ Smith & Hashemi 2006, pp. 361–362. ^ Bugayev, K.; Konovalov, Y.; Bychkov, Y.; Tretyakov, E.; Savin, Ivan V. (2001). Iron and Steel Production. The Minerva Group, Inc. p. 225. ISBN 978-0-89499-109-7. ^ a b Davidson, Hilda Ellis (1998). The Sword in Anglo-Saxon England: Its Archaeology and Literature. Boydell & Brewer Ltd. p. 20. ISBN 0-85115-716-5. ^ a b c Srinivasan, S.; Ranganathan, S. "Wootz Steel: an advanced material of the ancient world". Bangalore: Department of Metallurgy, Indian Institute of Science. Archived from the original on 2018-11-19. ^ Wagner, Donald B. (1993). Iron and Steel in Ancient China: Second Impression, With Corrections. Leiden: E.J. Brill. p. 243. ISBN 90-04-09632-9. ^ Needham, Joseph (1986). Science and Civilization in China: Volume 4, Part 3, Civil Engineering and Nautics. Taipei: Caves Books, Ltd. p. 563. ^ Gernet, Jacques (1982). A History of Chinese Civilization. Cambridge: Cambridge University Press. p. 69. ISBN 0-521-49781-7. ^ Wilford, John Noble (1996-02-06). "Ancient Smelter Used Wind To Make High-Grade Steel". The New York Times. ^ a b Srinivasan, Sharada; Ranganathan, Srinivasa (2004). India's Legendary Wootz Steel: An Advanced Material of the Ancient World. National Institute of Advanced Studies. OCLC 82439861. ^ a b Feuerbach, Ann (2005). "An investigation of the varied technology found in swords, sabres and blades from the Russian Northern Caucasus" (PDF). IAMS. 25: 27–43 (p. 29). Archived from the original (PDF) on 2011-04-30. ^ Srinivasan, Sharada (1994). "Wootz crucible steel: a newly discovered production site in South India". Papers from the Institute of Archaeology. 5: 49–59. doi:10.5334/pia.60. ^ Mahathevan, Iravatham (24 June 2010). "An epigraphic perspective on the antiquity of Tamil". The Hindu. Retrieved 31 October 2010. ^ Ragupathy, P (28 June 2010). "Tissamaharama potsherd evidences ordinary early Tamils among population". Tamilnet. Tamilnet. Retrieved 31 October 2010. ^ Needham, Joseph (1986). Science and Civilization in China: Volume 4, Part 1, Civil Engineering and Nautics (PDF). Taipei: Caves Books, Ltd. p. 282. ISBN 0-521-05802-3. ^ Manning, Charlotte Speir. "Ancient and Mediæval India. Volume 2". ISBN 978-0-543-92943-3. ^ a b c Juleff, G. (1996). "An ancient wind powered iron smelting technology in Sri Lanka". Nature. 379 (3): 60–63. Bibcode:1996Natur.379...60J. doi:10.1038/379060a0. ^ The Story of Civilization, Our Oriental Heritage. Simon and Schuster. 1935. p. 539. ISBN 0-671-54800-X. Retrieved 4 March 2017. ^ Sanderson, Katharine (2006-11-15). "Sharpest cut from nanotube sword". Nature News. doi:10.1038/news061113-11. ^ Wayman, M.L. & Juleff, G. (1999). "Crucible Steelmaking in Sri Lanka". Historical Metallurgy. 33 (1): 26. ^ Hartwell, Robert (1966). "Markets, Technology and the Structure of Enterprise in the Development of the Eleventh Century Chinese Iron and Steel Industry". Journal of Economic History. 26: 53–54. ^ a b Tylecote, R.F. (1992) A history of metallurgy 2nd ed., Institute of Materials, London. pp. 95–99 and 102–105. ISBN 0-901462-88-8. ^ Raistrick, A. (1953) A Dynasty of Ironfounders. ^ Trinder, B. (2000) The Industrial Revolution in Shropshire. Chichester. ^ Barraclough, K.C. (1984) Steel before Bessemer: I Blister Steel: the birth of an industry. The Metals Society, London. pp. 48–52. ^ King, P.W. (2003). "The Cartel in Oregrounds Iron: trading in the raw material for steel during the eighteenth century". Journal of Industrial History. 6 (1): 25–49. ^ a b c d "Iron and steel industry". Britannica. Encyclopædia Britannica. 2007. ^ Barraclough, K.C. (1984) Steel before Bessemer: II Crucible Steel: the growth of technology. The Metals Society, London. ^ Swank, James Moore (1892). History of the Manufacture of Iron in All Ages. ISBN 0-8337-3463-6. ^ Bessemer process. 2. Encyclopædia Britannica. 2005. p. 168. ^ Basic oxygen process. Encyclopædia Britannica. 2007. ^ Jones, J.A.T. ; Bowman, B. and Lefrank, P.A. (1998) "Electric Furnace Steelmaking", in The Making, Shaping and Treating of Steel, pp. 525–660. R.J. Fruehan (ed). The AISE Steel Foundation: Pittsburgh. ISBN 0-930767-03-9. ^ "Steel Industry". Archived from the original on 2009-06-18. Retrieved 2009-07-12. ^ "Congressional Record V. 148, Pt. 4, April 11, 2002 to April 24, 2002". United States Government Printing Office. ^ Chopra, Anuj (February 12, 2007). "India's steel industry steps onto world stage". Cristian Science Monitor. Retrieved 2009-07-12. ^ "Top Steelmakers in 2017" (PDF). World Steel Association. Retrieved August 22, 2018. ^ "Long-term planning needed to meet steel demand". The News. 2008-03-01. Archived from the original on 2010-11-02. Retrieved 2010-11-02. ^ Uchitelle, Louis (2009-01-01). "Steel Industry, in Slump, Looks to Federal Stimulus". The New York Times. Retrieved 2009-07-19. ^ Hartman, Roy A. (2009). Recycling. Encarta. Archived from the original on 2008-04-14. ^ Fenton, Michael D (2008). "Iron and Steel Scrap". In United States Geological Survey (ed.). Minerals Yearbook 2008, Volume 1: Metals and Minerals. Government Printing Office. ISBN 1-4113-3015-3. ^ The World Steel Association (2018-03-01). "Steel and raw materials" (PDF). ^ "High strength low alloy steels". Schoolscience.co.uk. Retrieved 2007-08-14. ^ "Dual-phase steel". Intota Expert Knowledge Services. Retrieved 2007-03-01. ^ Werner, Ewald. "Transformation Induced Plasticity in low alloyed TRIP-steels and microstructure response to a complex stress history". Archived from the original on December 23, 2007. Retrieved 2007-03-01. ^ Mirko, Centi; Saliceti Stefano. "Transformation Induced Plasticity (TRIP), Twinning Induced Plasticity (TWIP) and Dual-Phase (DP) Steels". Tampere University of Technology. Archived from the original on 2008-03-07. Retrieved 2007-03-01. ^ Galvanic protection. Encyclopædia Britannica. 2007. ^ "Steel Glossary". American Iron and Steel Institute (AISI). Retrieved 2006-07-30. ^ "Steel Interchange". American Institute of Steel Construction Inc. (AISC). Archived from the original on 2007-12-22. Retrieved 2007-02-28. ^ "Properties of Maraging Steels". Archived from the original on 2009-02-25. Retrieved 2009-07-19. 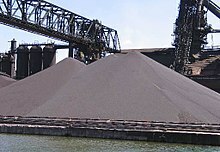 ^ Hadfield manganese steel. Answers.com. McGraw-Hill Dictionary of Scientific and Technical Terms, McGraw-Hill Companies, Inc., 2003. Retrieved on 2007-02-28. ^ Bringas, John E. (2004). Handbook of Comparative World Steel Standards: Third Edition (PDF) (3rd. ed.). ASTM International. p. 14. ISBN 0-8031-3362-6. Archived from the original (PDF) on 2007-01-27. ^ Ochshorn, Jonathan (2002-06-11). "Steel in 20th Century Architecture". Encyclopedia of Twentieth Century Architecture. Retrieved 2010-04-26. Ashby, Michael F.; Jones, David Rayner Hunkin (1992). An introduction to microstructures, processing and design. Butterworth-Heinemann. Degarmo, E. Paul; Black, J T.; Kohser, Ronald A. (2003). Materials and Processes in Manufacturing (9th ed.). Wiley. ISBN 0-471-65653-4. Verein Deutscher Eisenhüttenleute (Ed.). Steel – A Handbook for Materials Research and Engineering, Volume 1: Fundamentals. Springer-Verlag Berlin, Heidelberg and Verlag Stahleisen, Düsseldorf 1992, 737 p. ISBN 3-540-52968-3, 3-514-00377-7. Verein Deutscher Eisenhüttenleute (Ed.). Steel – A Handbook for Materials Research and Engineering, Volume 2: Applications. Springer-Verlag Berlin, Heidelberg and Verlag Stahleisen, Düsseldorf 1993, 839 pages, ISBN 3-540-54075-X, 3-514-00378-5. Smith, William F.; Hashemi, Javad (2006). Foundations of Materials Science and Engineering (4th ed.). McGraw-Hill. ISBN 0-07-295358-6. Duncan Burn, The Economic History of Steelmaking, 1867–1939: A Study in Competition. Cambridge University Press, 1961. Harukiyu Hasegawa, The Steel Industry in Japan: A Comparison with Britain. 1996. J.C. Carr and W. Taplin, History of the British Steel Industry. Harvard University Press, 1962. H. Lee Scamehorn, Mill & Mine: The Cf&I in the Twentieth Century. University of Nebraska Press, 1992. Warren, Kenneth, Big Steel: The First Century of the United States Steel Corporation, 1901–2001. University of Pittsburgh Press, 2001. Wikimedia Commons has media related to Steel. Look up steel in Wiktionary, the free dictionary. This page was last edited on 16 April 2019, at 07:50 (UTC).